We have been learning about the letter K. I typically include a lot of animals in our continent and environment studies so I tend to do our letter of the week themes around a different topic. This week K was for keys! We were able to do a lot of different activities with keys, and the kids enjoyed playing with them in many different ways. 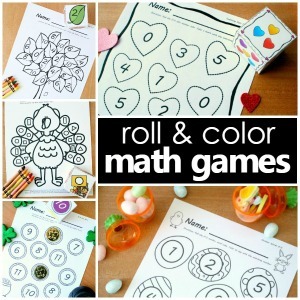 These are some of the reading activities we did, and in a separate post I will share about some of the math activities we did with keys. 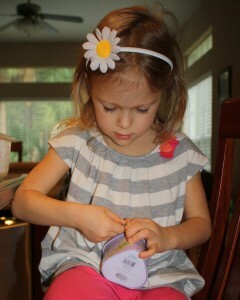 As I have mentioned before, I like to use concrete objects to practice many of the phonemic awareness skills. This week we used our keys to practice the concept of word. We began by placing our keys in a straight line. To practice the idea of the first and last word in a sentence, I asked them to point to the first key and then the last key. I also asked them to point to the key at the beginning and the key at the end. Then we practiced repeating a simple sentence and moving one key for each word in the sentence. Before we finished I said a specific word in the sentence and asked them point to the key that represents the word. This part of the task is in preparation for changing a word in the sentence, but we aren’t quite ready for that yet. 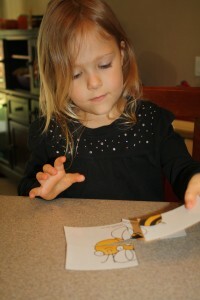 We used some of the learning activities from Take It To Your Seat Phonics Centers. I used a lot of books in this series while I was a classroom teacher, and I am finding that they are very helpful to have at home as well. This week I pulled some of the rhyming pieces from the Rhyme Squares Game. To keep it simple we focused on sorting only two sets of words, those that rhymed with key and those that rhymed with hat. One of the things I really like about the Take It To Your Seat Phonics Centers is that they are self-correcting. 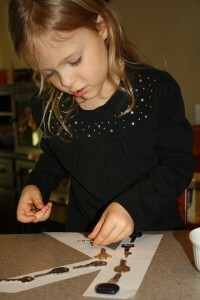 When the kids finished sorting the cards, they were able to turn over the cards to create a puzzle and check their work. 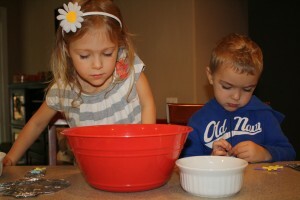 This is really helpful later when I place the activity on a tot tray or in a center where they will do it independently. 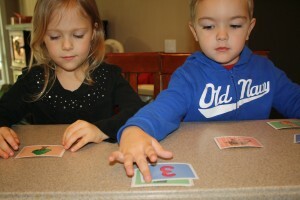 Later I used some of the pieces from the Begins With… game in Take It To Your Seat Phonics Centers. We practiced sorting picture cards by their initial sounds. We only used one of the sorting mats and the pictures that went with words beginning with r, k, or g. As the kids get more comfortable with these activities, I will expand to include all of the game pieces. After the kids were familiar with the picture cards we used the same pieces to play a little game. I hid different pictures in some of our treasure boxes. The kids used the keys and opened them to see if they found a picture that started with the letter k.
We made a very simple tin foil collage key and put foam letters on it to help the kids learn to recognize the letter K and associate it with a word (key). 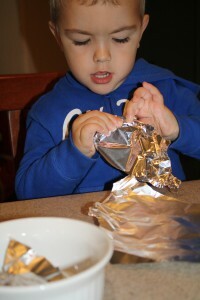 They really liked cutting and tearing the foil, an easy way to incorporate some fine motor practice. We also used our keys and a cutout of the letter K to practice making the letter K.
Then we used the same cutout to make some key rubbings. Each week we are creating a letter page to go in an alphabet book at the end of our school year. 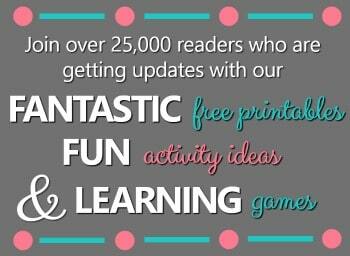 Do you do any key activities related to reading? And if you know of a great book about a key, I would love to hear about it. I found a few at the library, but nothing that we loved. These are fabulous ideas for a key-themed unit. I love the concept of having the keys represent words in a sentence – great way of building more advanced coding skills. The Take it To Your Seat Centers are a favorite around here, too. Thank you! The kids really enjoyed it and learned a lot a long the way. Thank you! And thanks so much for featuring on Facebook. What great ideas! 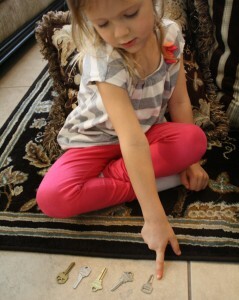 My girls love keys so they would adore any/all of these activities. 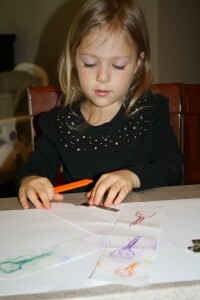 I especially love your key rubbings and the way you used keys to practice the first and last word in a sentence. Thanks so much! My kids all loved playing with the keys, too. I appreciate your feedback! I like your different ways of learning. 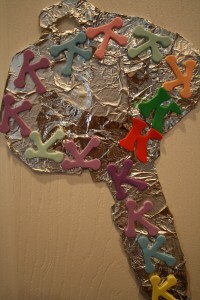 We also did K for key when we were on K – but we did painting with keys. I shall pin this to my letter learning board. Thanks for sharing. Thank you! I just checked out your key painting. I like how you did that!